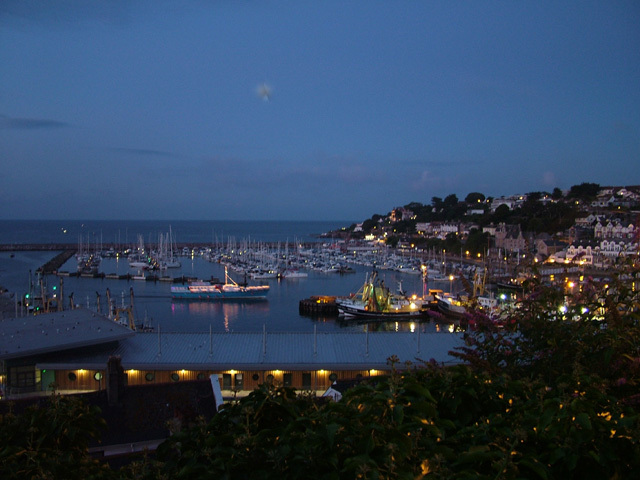 The layout of Brixham’s waterfront is perfect for an evening stroll. It is possible to walk for a good 45 minutes along the water’s edge, from the outer harbour, around to the inner harbour where the Golden Hind replica sits, then around the southern side to the marina and Breakwater Beach. From here you can walk along the Breakwater itself where the bay views are great across to Paignton and Torquay, or follow the coastline past Shoalstone beach and the outdoor seawater pool. On the inner harbour a brass band often entertain under the old fish quay during the summer, while a number of pubs, cafe’s and fish and chips shops offer refreshment. Watch, or join in, children dangling lines over the harbour edge, looking to catch crabs. Not sure if this is prohibited, frowned upon, or accepted by the harbour authorities, but it seems to be popular. Further around towards the marina, The Prince William and The Breakwater Bistro offer food and drink. For the most energetic, The Berry Head Hotel, out past Shoalstone Pool, offers meals and a bar overlooking the Bay from an enviable, elevated position. So in summary there’s lots of waterfront strolling to be done in Brixham. Nice views, nice atmosphere and plenty of ‘refreshment’ stops along the way.